Chester County Aggravated Assault Lawyer Simple Assault Lawyer | Criminal Defense | The Law Offices of Michelle A Fioravanti, P.C. Under Pennsylvania law there are 2 general types of assault: Aggravated Assault and Simple Assault. Assault charges are very serious offenses. Call the Law Offices of Michelle A. Fioravanti at 484-876-1543 or contact us if you have been charged with Aggravated Assault or Simple Assault to start working on the defense of your case as soon as possible. Aggravated Assault is the more serious of the 2 types of assault and carries with it the highest penalties. It is believed you caused or attempted to cause serious bodily injury if you have been arrested for Aggravated Assault. You will also be arrested for Aggravated Assault if you attacked a police officer, teacher, or other public officer, employee or agent. Uses tear or noxious gas or incapacitating device against a public officer, employee, or agent while acting in the scope of his/her employment. There are several defenses to the charge of Aggravated Assault. One is the Commonwealth, through the Assistant District Attorney, did not meet the burden of proving all the elements of the crime charged. Another is you simply did not do what is alleged, which is a very fact sensitive analysis. Another defense is that you acted in self-defense against an attacker. You should speak with an experienced criminal defense attorney to discuss your case. A conviction for Aggravated Assault is a felony sentence. First, if you are guilty of Aggravated Assault of numbers 1 or 2 listed above, you will be guilty of a felony of the first degree. This is the most serious grading for a crime. If you are charged and found guilty of any of the other actions listed above, you will be guilty of a felony in the second degree. Aggravated Assault is a very serious offense. It is important that you call the Law Offices of Michelle A. Fioravanti at 484-876-1543 or contact us so that we may start preparing a defense as soon as possible. Simple Assault is the less serious of the assault charges. Generally, it involves hitting another person. The defenses to Simple Assault are similar to that of Aggravated Assault. One is the Commonwealth, through the Assistant District Attorney, did not meet the burden of proving all the elements of the crime charged. Another is you simply did not do what is alleged, which is a very fact sensitive analysis. Another defense is that you acted in self-defense against an attacker. You should speak with an experienced criminal defense attorney to discuss your case. A conviction for Simple Assault is a misdemeanor sentence. If you are found guilty of Simple Assault, you will be guilty of a misdemeanor of the second degree. 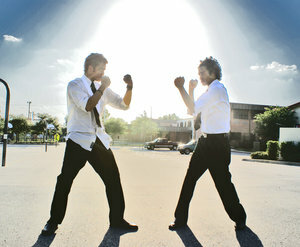 However, if you were involved in a mutual fight, then your sentence is lowered to a misdemeanor of the third degree. Finally, if you are over the age of 21, and you are found guilty of Simple Assault of someone under the age of 12, you will be sentenced to a misdemeanor of the first degree. You may be facing serious jail time and fines if convicted of Simple Assault. It is important that you call the Law Offices of Michelle A. Fioravanti at 484-876-1543 or contact us so that we may start preparing a defense as soon as possible.